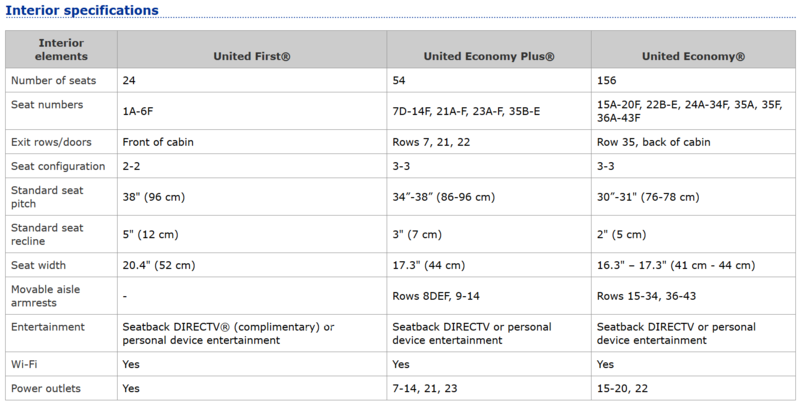 United is reconfiguring its 757-300 planes to increase density, primarily by adding non E+ seats (1 fewer E+ seats, 22 more E seats). In the meantime, you may see an oddball hybrid seat map (scroll to bottom of wiki) that appears not to make available any seats that don't exist on both planes or are otherwise different (e.g., exit rows on one but not the other plane). If you see a seat map that looks what's below this then your confusion is understandable. United does not appear to be flying a 757-300 in this configuration, nor do its plans indicate that it will. It appears to be some sort of placeholder to prevent problems if United uses the newer (or older) seating version on a given route. See discussion beginning around post #100. This seatmap will be changed to the one for the scheduled equipment typically 48-72 hours before departure. Check back then for seats to become available. West Coast to HNL. DTV doesn't work over the Pacific anyway, so it was mostly useless on those flights - only 4 or 5 pre-recorded movies would be available. I was referring to not upgrading the wifi so it works overwater. I could not care less about DTV. Still, I wish in this case UA did copy DL and installed a modern entertainment system, instead of just taking screens out. Probably a totally separate discussion though. Although DL also has aircraft with no video screens. Please read again. My aircraft did not have DTV. So blaming the DTV contract does not wash.
UA will apparently have nine of these no DTV, Ka band aircraft once they've finished the retrofit. Correct, but the dTV contract covers the WiFi connection on those specific 9 units, even after the dTV has been removed. I agree it makes no sense, but is apparently true. Edit to Clarify: CO contract with dTV was not for just directTV, but for all onboard entertainment, which is why the 737s and these 753s have a different WiFi provider in the first place. I'm currently on the 757-300 on 10/1, no aircraft has been assigned yet however looking at the flight history of UA411 from ORD to LAX it looks like its common for the 738 and 739 to also be swapped in. Seat map currently is showing completely full, however I guess they could swap to a smaller a/c depending. Currently debating on a mileage upgrade to F, I'm plat but not betting on a CPU for this trip. Flying from SFO to ORD on Tuesday. Question which is the better row for exit row seating? 21 or 23? Also have a backpack can I sit in row 23 A or F? Its a reconfiguration Boeing 757-300. New aircraft that has added rows including row 22. I picked 21 as for four hours during the day I just want leg room. Don't care about the recline. However, this flight is within two days and united is doing a bad job in general to figure this out. Flying on the same plane Sunday of this week and still don't know if its a new 757 or an old one. I had the a/c change 3x in last 48 hours. UA will swap a/c in last day or two as IRROPs mangle plans and affect availability of a particular a/c. Crew stays the same. That's really pushing absurdity when F is +$209. Yes, if you are in 23A or 23F you can store an item under the corresponding seat in row 21. However, you will need to unbuckle and get up to access it. 23A/F have "unlimited" legroom, but 21A/F are "safer", as they will survive equipment swap, even to a non-757 type: row 21 is an extra legroom exit row seat on all UA mainline aircraft. Hi. How is Row 35? I am Platinum and 8A is available now. Wednesday evening flight and plane has switched once to HD config but I am scared it will switch again and I am someone who likes to be in the front or back row of a cabin. So 8A may end up being a second row if it goes back to old. From what I see, 35 is bulkhead on both configurations. And I am short so legroom is not an issue. Thanks! Sorry @daisyatl cannot help you with your question. I am however fascinated by your seat preferences of front or back row. Is this because you perceive it is quicker in an emergency or do you get claustrophobic? The latter. I am claustrophobic so get anxious if there are people on all sides of me. So I always go with bulkhead or back row.